The killer cop in this instance is black; young Mr. Collar was white. But instead of focusing on the fact a young man was gunned down in cold-blood by a constitutionally-protected government mercenary, she chose the black cop-white victim angle on a two-year-old case. Of course Fox News, Alex Jones, and other “conservative” instigator outfits picked up the story and went wild with it. They also bring up the case of Mr. Dillon Taylor, who was gunned down by Salt Lake City killer cop Bron Cruz on August 11, two days after Michael Brown was murdered in Ferguson. State-run media and conservative agitators have described the killer as “non-white,” and of course chant the proverbial “where’s Al and Jesse,” which has become a common rallying cry for this group. Instead of focusing on the real issue here, Americans and the state-run media that controls most of their thoughts and feelings, have now successfully ruined an opportunity to address this police state that’s beginning to mirror Nazi Germany. The reason some of these cases aren’t talked about is because, well, there are too many of them to keep up with. Operation-Nation has written about, Tweeted, or mentioned in other stories, 814 victims of police state murders since we went online in 2007. U.S. police departments are not required to report “officer-involved shootings,” assaults, rapes, or murder in other ways to anyone, so there is no accountability or exact figures. But the Centre for Research on Globalization and the CATO Institute conservatively estimate that more than 5,000 Americans have been killed by cops since 2003. If we include all the unpublished drafts on our WordPress blogs (because we simply don’t have the manpower or resources to keep up), Operation-Nation channels would have covered over 1,400 police state murders since 2007. Its safe to say two Americans are killed per day by cops on average, which would put the total well over 6,000 since 2003. San Juan County, New Mexico cops shot and killed a man last night. An LAPD cop groped and completely violated a handcuffed woman on tape last night, bringing her to tears after realizing she basically had been raped by cops, a profession known for hiring many pedophiles and rapists. A Los Angeles County cop also shot someone last night. Simply put, you’d need a fully staffed news bureau to cover each and every incident of an American murdered, raped, or assaulted by cops. State-run media (CNN, Fox News, MSNBC, et al.) also carefully pick and choose the ones they want to cover round the clock to further the overall divide-and-conquer agenda. Someone is probably being killed by a cop as we speak, but state-run media will not mention any of them unless there’s an opportunity for increased ratings and racial divide on their social media channels. Most of the tea party websites that re-posted the Washington Times article are followed by comments such as “where’s the outrage” and “no buildings are being burned down” for Mr. Collar who was killed by a black cop. Instead of CREATING the outrage themselves and protesting loudly over this young man ‘s death, they change the dialogue to “where’s Al and Jesse” and appear to dwell on a self-manufactured double standard. They are basically instructing black America to do the protesting for them. The truth is “patriots” only get outraged when federal police under the control of President Barack Obama interfere with cattle ranchers and their cows. Tea party militias from all over the country arrived in Nevada this past June to protect Cliven Bundy’s cows from Bureau of Land Management police, and even insinuated the incident could spark the second American Civil War. Cows and Obama cops move the meter for patriots, while every day murders by state and municipal cops receive “atta boy officer” and other accolades from them. Black people do get outraged when white Americans are killed by cops, particularly myself. But the subsequent venom from patriots proves they don’t really want our outrage. We like to believe our coverage of Southwest City, Missouri cop Brian Massa murdering Mr. Bobby Stacy in March of 2010 helped lead to the killer cop’s manslaughter conviction. Bobby’s family and many in the Southwest City community were very appreciative. But several patriots released their venom to the extreme. Most of their comments were deleted before being published, but we let a few through just so people could see what we deal with on a daily basis. Keep in mind, Ms. Moss is Bobby’s mother. There were hundreds more that contained much more vile pejoratives, and even threat to kill all of us and our families. We also like to believe our coverage helped lead to the negligent homicide conviction of Bella Vista, Arkansas cop Coleman Brackney, who murdered Mr. James Ahern that same year. But the venom from patriots was just as vicious here. The families of the victims and those fighting against the police state always appreciate our work. The cop-apologist, unconditional police-love crowd will always outnumber them, however. Granted the number of white people being murdered by police has increased significantly since 2008. It was virtually unheard of for white Americans to be killed by police prior to 9/11. But being killed by police has been reality for black Americans since cop organizations began forming in the early-mid 1800s. A ProPublica data analysis published in October found that black men are 21 times more likely to be killed by cops than white men. Not only is it still relatively rare for white Americans in general to be killed by cops, but even more rare for the killer cop to be black. Mr. Collar is the only instance we can find under these circumstances since 2000. 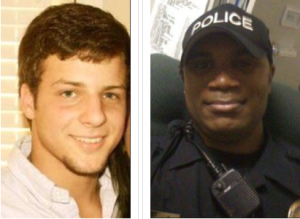 The exact race of the cop that killed Mr. Taylor is not known, but for the sake of argument, we’ll say he’s black, for a total of two incidents like this. These patriot websites must continue to repeat these two incidents (despite the fact they could care less about the actual victims) because there simply are no others. Search Google, Yahoo! and Bing, and all you’ll get for “black cop kills white victim” are these two stories. None of the 59 stories we’ve covered since 2007 that involved white victims had black killer cops. In fact, there were only 8 incidents total that involved black killer cops, regardless of the victims’ race. But one thing that can’t be ignored is when we do write about white victims, those stories always receive far more clicks and comments than those with black or Latino/a victims. Further, none of these conservative websites seem to care that a big Mexican Fullerton, Calif. cop named Manuel Ramos beat white Mr. Kelly Thomas to death in July of 2011. He and white Jay Cicinelli, the other cop charged in the case, were both acquitted of murder; and Ramos now coaches little league baseball in Fullerton. 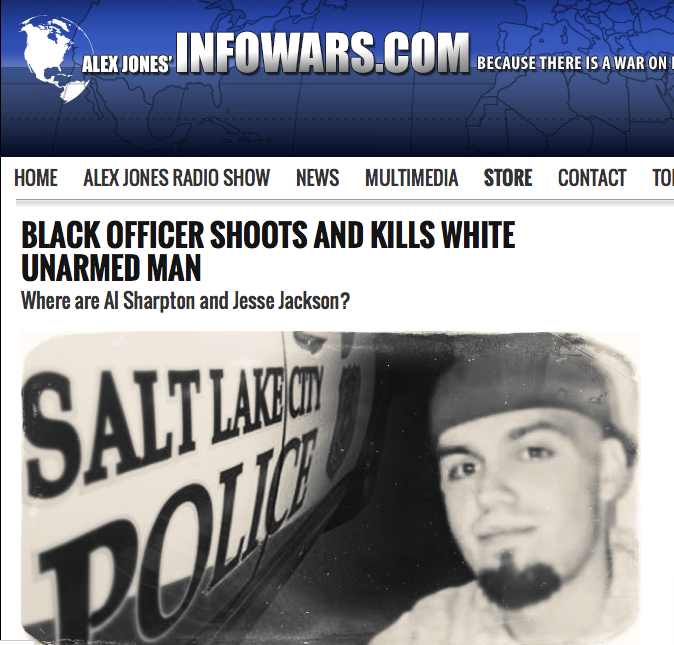 The Fox News, InfoWars, and other tea party outfits and their fans have no genuine interest in truly addressing and attacking police state murders, rapes, and assaults in America. Their only goal is to change the subject from cops murdering Americans with impunity to a useless race argument that buries the real issue. At the end of the day, these individuals will still love their “officers” even if one killed their mother. And unfortunately, that is no exaggeration. There is one common denominator in all instances of Americans murdered by cops: the killers are always wearing a badge. Most of them wear blue costumes, some the brown/tan county sheriff outfits, while others wear the black military SWAT outfits for invading people’s homes and killing them, or to attack unarmed protestors. The murders of Mr. Michael Brown, Mr. John Crawford, Mr. Gilbert Collar, and Mr. Dillon Taylor have presented Americans of all walks the opportunity to force an end to police state policies that effect us all. But instead its turned into black this, white that, Jesse Jackson here, double-standard there. We’re simply defeated and lost as a nation because everyone is so consumed by petty differences despite this problem affecting all of us. Even when 6,000-plus Americans have been murdered by cops since 9/11 (that’s more than U.S. soldiers killed in Iraq), most still refer to police as heroes and Muslims who are 10,000 miles away as terrorists. Its all very frustrating, but we’ll continue covering police state murders committed by those wearing badges until we’re physically unable to. The clothing and pigmentation of the victims will continue to matter not.